Providing convenience and quality to our patients is important to us. We offer modern dental treatments to maintain and repair your teeth and gums all in a friendly and comfortable atmosphere. From preventive treatments to restorative treatments, we provide you with all the options available to maintain a healthy, beautiful smile. There is very little that we cannot do in our office. We understand that most our patients do not like to be referred to a different office. Because of this, our dental team stays on top of the latest developments in the ever-changing world of dentistry. You will notice the quality we offer right from your very first visit! At Charlotte Progressive Dentistry in Charlotte, NC, we’re passionate about providing some of the best general and cosmetic dental services in the area. As a leading family dentistry, we offer a large array of dental services for both children and adults. When you need root canal therapy, tooth extractions, dentures, mouthguards, or same-day emergency dental treatment, you can trust our team to help. Our dental office also specialize in cosmetic dentistry services, such as professional teeth whitening, dental bonding, crowns, veneers, dentures, and more. If you’re interested in seeing what our dental customers have to say about our services, be sure to visit our testimonials page. 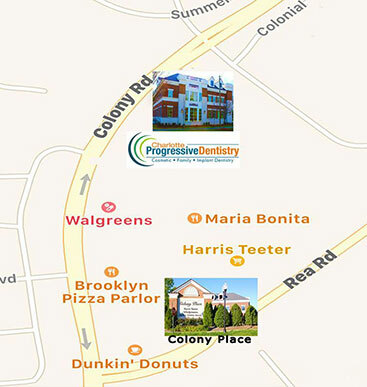 To schedule a dental appointment at Charlotte Progressive Dentistry, contact our friendly staff today.